Out of Stock. Cloth and E-book editions are available. The first edition of this seminal book in 1971 pointed out the fatal defects of Marxist theory that would lead to the collapse of the Soviet economy. In this revised edition, Paul Craig Roberts examines how reality triumphed over Marxist theory and the implications for the future of Russia and eastern Europe. In 1971, Roberts created a firestorm among professional Sovietologists by proclaiming that the economies of the USSR and its East Bloc allies were doomed because their planned economies were, in reality, anything but planned. Expanding on his original ideas, Roberts demonstrates in this book the fatal shortcomings of Marxist economies, ranging from misallocation of resources to ersatz capitalistic concepts grafted onto a system that calls for production without regard to profit. 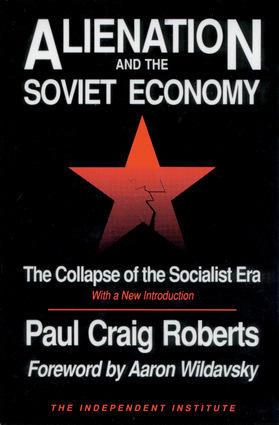 Roberts argues that the economies of the nations emerging from the USSR’s collapse must grasp the profound truths in this book if they are to become viable. Paul Craig Roberts is the chairman of the Institute for Political Economy and a nationally syndicated columnist.